The active Mount Unzen volcano sits at the center of Nagasaki’s Shimabara Peninsula. It’s known as the deadliest volcano in Japan because of its multiple eruptions over the last couple of centuries which claimed many lives. The mountain along with the breathtakingly beautiful surrounding was made part of the Unzen Amakusa National Park in 1934. Unzen has since attracted many tourists who come to enjoy the views, hiking trails, onsens and many other attractions which we will discuss here. 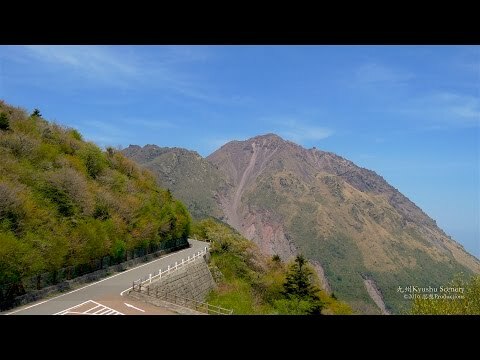 In this video Shiso Productions shows the beautiful scenery in and around the majestic Mount Unzen. The footage is owned and created by Shiso Productions. The multi-million year old Mount Unzen is a group of several overlapping strato-volcanoes. The two main peaks are Heisei-shinzan (1486 meters) and Fugendake (1359 meters) – both summits are reachable through hiking. So why would someone want to visit such a potentially deadly destination? Well, as it turns out there are a number of good reasons.. if you are brave enough. Want to enjoy the spectacular views from the top without doing the actual hike? If so, you will be glad to know that there is a lower and upper ropeway station on the Fugendake section. The first ropeway station (Nita pass station), which sits at a height of 1,100 meters, can be reached by either hiking or traveling along the Nita-toge Pass. The second one (Myokendake station) sits 200 meters higher at 1,300 meters. The Unzen Ropeway won’t take you to the top. To reach the peak from Myokendake station will require an additional 1 hour long hike. Each ropeway station features observation decks offering beautiful views. The lower station has a parking lot and various stores from where you can buy food and drinks. There are a number of options for those who choose to hike Mount Unzen. The longest route starts from Shimabara Town at the eastern base of the mountain and the full day hike requires you to first walk through the entire town. Just reaching Unzen Town will take approximately 5 hours and it can hardly be called a hike since you will be walking along a roadway the whole time. A shorter option is by taking a bus to Unzen Town from where you can start the actual hike. From here it will take about 3 hours to reach the summit. The easiest and quickest way to reach the highest peak: Travel along the Nita-toge Pass to the lower Nita Pass ropeway station. It’s a toll road that will cost around ¥100 ($1.00). Once there ride the ropeway to the Myokendake station from where it will be an easy short 1 hour hike to the Fugendake Summit. It sits at 1,359 meters above sea level and is the highest peak that you can reach. All hiking trails are clearly marked and have safety zones in the unlikely event of a volcanic eruption. Also, camping is prohibited but it’s tolerated next to the parking area of the golf course. Download maps of each hiking trail from the unzen.org website. The word Unzen Jigoku translates to ‘Unzen Hell’ and the name is very fitting. A walkway will lead you through a hellish looking landscape dotted with boiling hot springs while the strong stench of sulfur and steam fills the air. Criminals were regularly bought here centuries ago where they would be tortured and killed by throwing them into these hot springs. During the Edo Period when Christianity in Japan was illegal, 26 Christians were bought here who suffered the same fate. The Heisei Shinzan Nature Center sits near the base of Mount Unzen and is a beautiful little museum that provides information about the volcano. The easiest way to reach it is from the nearby Shimabara City. Also, there are a number of short and easy walking trails around the nature center that will lead you to various viewpoints of Mount Unzen. It’s a known fact that playing golf during a thunderstorm could cost you your life; but playing a round at the Unzen Golf Course brings about a whole different element of danger. The golf course, which has been around since 1913, can be found to the southwest of the volcano. It also happens to be the oldest golf course in Japan. Visit their website here – ‘Website is in Japanese only’. There are around 30 acidic sulfur onsens scattered around Mount Unzen. The most popular being a hot spring resort which sits on the southwest of the mountain. Learn more about these hot spring resorts. Caution: It’s important to only use designated onsens because some are far too hot and can cause serious injury or even death. Shimabara is a small, yet historically rich town that sits at the base of Mount Unzen. It was once the home of the Matsudaira samurai family and the ruins of their castle can be found here. The town is also where the Shimabara Rebellion took place and it suffered great damages and loss of life during the 1792 volcanic eruption. Shimabara serves as the ideal base for those who wish to explore Mount Unzen. Read more about this beautiful historical town here. There are two eruptions that stand out in Mount Unzen’s history – the major 1792 and smaller 1991-1993 incidents. On the night of March 21, 1792 the single worst volcanic eruption in Japanese history took place. Mount Unzen’s Mayuyama dome blew off and landed in the ocean causing a 100 meter tall mega-tsunami. The tsunami hit the Higo Prefecture coastline only to bounce off and return to cause further devastation to Shimabara. The mudslide from the initial eruption combined with the tsunami destruction along the two coastlines resulted in the death of 15,000 people. The second was a series of events occurring between 1990 – 1995. The most fatal incident took place in 1991 when a group of scientists and some of their drivers were caught off guard during an eruption and cost them their lives. A total of 43 died. What makes Mount Unzen so particularly dangerous is the vast amounts of people who live so close to the volcano. But fortunately, no incidents occurred since 1995 even though the volcano is still active. Each season brings something unique to the region so there really is not a bad time to visit Mount Unzen – except for in the case of an eruption of course. Visiting in Winter: The winters aren’t as cold as other parts of Japan due to the regions sub-tropical location. Furthermore, you will appreciate and enjoy the hot springs so much more in colder weather. Visiting in Spring / Summer: Nagasaki gets really hot during Summer but this is when the mountain becomes a popular destination for locals thanks to the cooler climate caused by its higher elevation. The most beautiful pink Azaleas bloom across the mountain during Spring while the Summer brings lots of greenery. Visiting in Autumn: If you visit here during Autumn you will be in for a treat because Unzen is one of the best Autumn color spots in Kyushu. The mountain slopes become extra beautiful with its bright orange colors so visiting during this period will provide plentiful photo opportunities. Find out more about this wonderful Nagasaki tourist destination and its surrounding areas from the official Unzen Tourist Association website. The Mount Unzen ropeway has its own website. Find out about its history, how to access the stations and much more at unzen-ropeway.com.